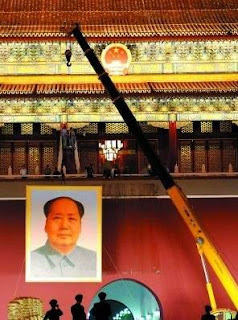 The Telegraph confirmed a story that had been circulated on the Internet for a couple of days, that the giant portrait of Chairman Mao on Tiananmen was defaced by a man throwing ink bottles on it on April 5. The man was comprehended but no detail about him or his motive was disclosed. April 5 is the memorial day in Chinese tradition. More recently in 2007, a man threw flaming object to the portrait and also managed to cause damage to it.